Home / Blog / Investment Insights / Winter 2014: If you want to go fast, go alone. If you want to go far, go together. Winter 2014: If you want to go fast, go alone. If you want to go far, go together. In the previous two annual long-term (3-5 year) outlooks—Trouble with the Curve & A Whole New Ball Game— we have taken you to a metaphorical ballpark to help explain the complex maze of capitalism, the markets, and the global economy. With the U.S. Stock market racing at high speeds in 2013 and with NASCAR’s most popular driver, Dale Earnhardt, Jr., recently winning the Great American Race (Daytona 500), we decided to change the pace and the venue to one with more similarities— where the drivers go fast, there’s irritatingly high levels of noise, and where dramatic crashes seem to be an inevitable part of the experience. Continuing our approach that has served Plan Financial’s clients well for almost 30 years, our annual 3-5 year outlook for the global economy provides the guardrails for how, where, why and when we invest the funds that you have entrusted to us. During this process each year, we hear the insights of global thought leaders and experienced professional oracles. Using this disciplined approach, we identify the layout of the course (major trends), and translate it into the forward-looking strategies in which your portfolio is positioned. This is one of the most important processes we apply and it effectively fuels many of our most important decisions. It tells us: Which direction the course is headed; which lanes to drive in and the multi-speed dynamics within and across lanes (countries); how fast to go; and, what the drivers around us are doing. Going into this year’s outlook, I must admit that I found the context even more challenging than usual. This complexity is not just due to a global economy in the midst of historical realignments between a single team of developed economies and multiple teams of developing economies. It’s also because highly experimental central bank policies have disconnected most stock and bond prices from the underlying economic and financial fundamentals. P1: Retirees pay a price because they can’t earn enough on their savings (CD’s, money markets, which we refer to as “First Pillar” assets) to meet their expenses. P3: While repression initially benefits corporate margins, corporations are showing less confidence than investors, and have yet to expand aggressively. Instead, they have remained quite focused on cost control and stock buybacks— which artificially inflate corporate earnings and stock prices— as opposed to investments in new plants, equipment and hiring. Households also vary tremendously. In the emerging world, the remarkable social transformation has continued, with millions more being pulled out of poverty (especially in China). This is unfortunately not the case in the West. Financial repression and its conjoined policy of Quantitative Easing (QE) — the Fed being the printer and primary buyer of its own debt — may have only redistributed wealth as opposed to creating it (picking savers’ pockets while recapitalizing banks and the wealthiest 1% of our population), while the middle class continues to be squeezed and lower-income households have struggled as too many lack jobs and have been forced to draw upon dwindling savings. Yet, if this now near 5-year road of zero-bound yields and QE cannot produce the real speed (read growth) that markets are priced for (and they have not), then institutional and other astute investors—like Plan Financial—will begin to move away (and we have) from traditional risk assets and gravitate toward an array of higher return alternatives. Lost in this complex maze is the function of credit and credit expansion and its impact on the ability of the economy to grow. Asset prices (stocks, houses, cars, etc.) and interest rates are dependent on credit expansion or contraction. If there was only one dollar to lend and someone was desperate to have it, the interest rate would be usurious. If there was one trillion of credit and no one was eager to borrow for some reason or another, then the rate would be .01% like it is today and for the past five years in my personal money market account. With credit growth slowing due in part to lower government deficits, and QE now tapering (which will slow the speed on the track) the U.S. and other similarly credit-based economies may find that future growth is not as robust as the model-driven forecasters might assume. The Fed will have to continue to taper, cease and then desist someday. They can’t just keep adding one trillion dollars to their balance sheet every year without something negative happening—either accelerating inflation, a tanking dollar or a continued unwillingness on the part of corporations to invest because of the low and unacceptable returns on investment. QE has to die sometime. Just like NASCAR, wrecks and creative destruction seem to be part of the Grand Economic Scheme. Which Drivers are Building the Most Momentum for this Next Season? Both the taper and the Fed policy rate are dependent on 1) economic growth, 2) the level of unemployment, and 3)future inflation—the third driver which, amazingly, no one seems to care. We consider the annualized inflation rate a critical statistic. Why? The Fed, Janet Yellen and her team of Fed governors and regional presidents, have told us so. At the moment, the Fed’s pace car (target) for inflation is 2.0% or higher, while December’s annualized rate was only 1.2%. Miles to go in this race before anyone has to begin worrying about a policy rate hike! 1998: the second-to-last year of the tech bubble. 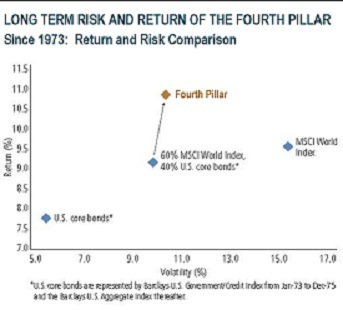 In every single case since 1973, when the MSCI World Index subsequently delivered negative three-year returns, the Fourth Pillar produced positive three-year results 98% of the time. Now that’s diversification when you need it! Put a different way, as seen in the chart below, the Fourth Pillar beats mainstream stocks with much lower risk, for those with the patience to weather a bit of short-term pain for the potential longer-term performance. Extremely easy global monetary policies will fuel asset speed, until . . . well, until they crash. But, it’s impossible to know when that will happen. It seems to make sense to build a robust Fourth Pillar of assets that diversify away from mainstream stocks and bonds, provide higher yield, higher growth, or both, and offer the potential for better returns in the face of rising inflation. Neither the racetrack nor the market care a whit for your losses or your hoped for double-digit return from an equity/bond portfolio that is priced for much less. Our drive is to position the savings, pensions, investments, and retirement funds you have entrusted us to manage to go far. To cross the finish line, to realize your dreams, it will take a pack of diversified, inflation protected, and forward-looking drivers to avoid the multi-car “wrecks” that can take you out of the race altogether. Past performance is not a guarantee or a reliable indicator of future results. All investments contain risk and may lose value. This material contains the current opinions of the author but not necessarily those of Plan Financial and such opinions are subject to change without notice. This material is distributed for informational purposes only. Forecasts, estimates, and certain information contained herein are based upon research and should not be considered as investment advice or a recommendation of any particular security, strategy or investment product. Information contained herein has been obtained from sources believed to be reliable, but not guaranteed. No part of this article may be reproduced in any form, or referred to in any other publication, without express written permission. Plan Financial is a trademark or a registered trademark of Plan Life & Wealth Management, Inc., in the United States. © 2014, Plan Financial.